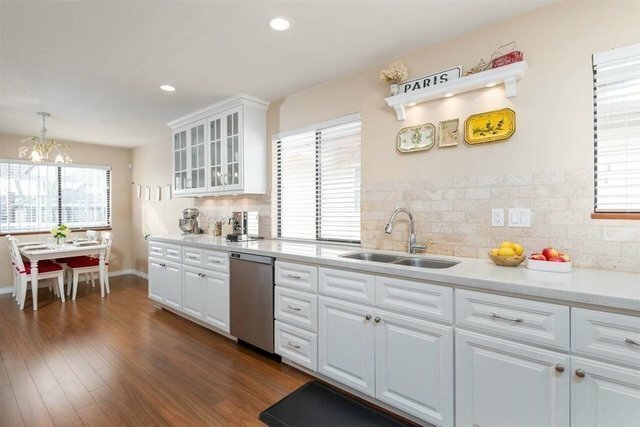 This 2 level family home has been completely renovated, and marries contemporary updates with a classic and functional floor plan: 3 bedrooms up, a master bedroom with full ensuite, open living and dining areas, wood burning fireplaces, and a beautifully updated kitchen and baths. The lower level offers a handsome 2 bedroom legal suite with separate entrance, perfect as an authorized inlaw suite or mortgage helper. Upgrades include central air conditioning, high efficiency furnace, new blinds, countertops, appliances, laminate and tile flooring. The 2 car garage boasts an extended driveway for an additional 4 open parking spaces. A wonderful family home in a coveted location, centrally positioned with direct access to the Ridgeway Greenway bicycle route.